On a Wednesday evening in late March, 100 people found their way inside the auditorium at Clif Bar headquarters for a gathering to celebrate high school mountain biking. Over two hours, food and drinks were enjoyed, stories were told, the documentary “Singletrack High” was shown and a cycling community came together. Team riders (L-R) Hunter, Donovan, Alex, Harrison, Emilio, Lucas and Jacob share their stories about riding with Richmond Composite on stage at Clif HQ. Photo by Briana Marie. People arrived into the lobby of the auditorium to pizza and friends new and old. High ceilings and walls full of art tell the story of Clif Bar, a company born on a bike. The office facilities celebrate all things outdoor adventure and community connection, making it the perfect setting for our event. There are bikes on walls, hanging from the ceiling, in photos, and rolling through the door with incoming attendees. We were in good company. I take the team on a brief tour of the office. To new eyes, this “office” looks more like an engaging museum. We stop to look at the photo display of the Clif Pro team. It’s a wall full of large format pictures of some of the strongest women mountain bikers in the world. Stories about Clif Bar starting the Luna Chix pro team in the early 2000's as one of the first all female (and dominant) mountain bike team are shared. We finish the tour next to some bikes on display hanging above a door opening. They are acompanied with raceplates and plaques commemorating wins in major mountain bike races from around the world. 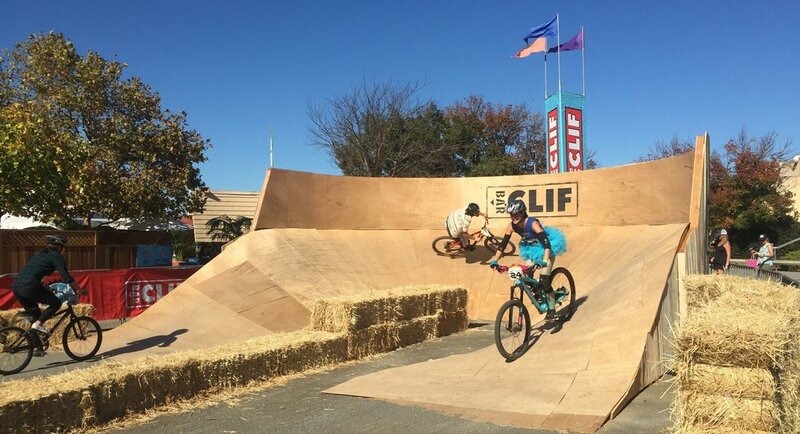 They represent achievements of strong female mountain bikers and hang each day as a reminder of the success of the Clif Pro Team. For us they are a light in the distance, hardly visible, flickering in the fog. The team knows what they’re seeing is incredible, but the full context isn’t realized yet. I repeat, “The women that have raced on this team are amazing, not just for their race awards but for their determination and perserverence coming up in a sport dominated by men. These women are humble and kind AND will also rip your legs off on a trail.” Some of the team chuckle, some gasp, some eyes get wide. All reactions that collectively show "Whoa!" We wrap up the tour and hear a call for everyone to enter the auditorium. The festivities are about to begin. Clif Bar Sports Marketing Coordinator Lucas Euser take the stage and kicks off the evening. He shares a variety of insightful stories from his own experience racing bikes in high school and on into a professional road racing career. “Tonight is special for a number of reasons,” Euser begins. “20 years ago today I lined up for my first mountain bike race. I was 13 years old.” He goes on to describe a pioneering time for high school mountain biking, peppered with anecdotes from his early days racing, joining a team and the beginning of what would become the Norcal League and later the national organization for high school mountain biking, NICA. Lucas connects bikes throughout time to social change and adventure alike. What would happen to these cyclists in the next 20 years? What would they do with this bicycle they were building this relationship with? Where might the bicycle take them? Then he handed it over to our team to jump on stage and provide a window into our world through a bit of storytelling. Seven of the 15 members of Richmond Composite are in attendance at the event and all seven of them step onstage to sit in a semi-circle together facing the crowd. We hand out microphones and as they adjust to the bright lights and tall chairs, I ask the team, “How many of you have gotten on stage in front of a big crowd with a microphone to answer questions before?” Nervous laughter, head shakes and then a smile and one hand goes up. “Really?” I ask. “Well that’s what we’re about to do. Relax, there are no wrong answers, just imagine it’s the end of a normal practice and we’re circling up to share stories about our day like we always do...only this time we have microphones, lights, tall chairs, and a bunch of people hanging out to listen in the darkness.” A little laughter helps ease the nerves and we settle in. I’ve prepared a number of questions for the kids, but as usual, the plan is only as good as my ability to adjust in the moment to what is actually going on rather than what I might have planned. I start with some easy ones - what’s you’re name, grade and how long have you been riding with the team? “About two weeks.” Says one rider. “Since the beginning.” Says another, as if the beginning were some long distant event in the past and not just six months ago. Being one of the founding members of the team is still compelling and comes with a certain air of respect. He’s seen some things, is wise beyond his 14 year old stubble. As we move into the more interesting questions, the kids loosen up and start having fun. They’re telling stories, listening to each other and playing off of each others' experiences to help paint a picture of what it’s like being a rider on team Richmond Composite. Thier unique personalities begin to emerge. They are heartfelt, quirky, serious, and silly. They share their experience starting mountain biking and joining, for many of them, thier first team of any kind. And the audience can relate. Trying on bib shorts for the first time and then figuring out how to pee with one on. How a hill or obstacle can be so difficult at first try and then just days later be conquered. The challenge and the triumph. The amazement of being able to do something you never knew was even possible. The simple things like being outside in nature and truly appreciating it. Meeting new people and making new friends. Pushing yourself to your limit in a race for the first time. The kids take us through all the hallmarks of being on a team and finding a new love for mountain biking. It's like witnessessing a transformation mid-process for seven young people. These moments are so raw and fresh and still being formed. Just like the young people themselves, in development, in motion, becoming who they are going to be. We end the interview as we often end our practices, races and meetings—with gratitude. Both in the words expressed directly to the audience for their support of our team and in the stories kids shared that brimmed with excitement and thanks for all of the good they’ve experienced by participating in this sport. Kids are grateful to be able to "play" biking with new friends and coaches in beautiful parks and mountains around their home and greater Northern California. During a time in life often marked by turmoil and a yearning to connect, here are seven young people getting connected to their bodies, their place, hard work, reward and a new growing community. “Look out into the audience,” I speak into the mic. “We are your direct team here on stage. Out there in the audience is the larger community you stepped into when you joined this team.” The kids peer out through bright spotlights to make out 80 shadow-like figures beyond the stage. “These are the people who support you with their time, bikes, equipment, donations and stoke. They are here because they believe what you’re doing is good. They want to see you thrive. Take a moment and breath this in.” And for the first time all night, and maybe ever as a team, we are quiet. More videos from the evening on our YouTube page. I don’t know that any teenager joins a high school mountain bike team to “build character” but lining up for your first race ever in the pouring rain after being on the team for only a week’s time is surely character building. If you survive the damn thing and come out on the other end with a smile on your face, like new team rider Hunter did during our third race, then I’d say you might just be in for a career as a character contractor. At the very least I’d say you’re hooked on the whole mountain bike thing. For race #3 our race crew was paired down to three riders. Jacob, entering his second race ever, new rider Hunter, his first, and our most veteran racer to date, Sergio, lining up for his third consecutive race. I met up with Hunter at Richmond High where we busted Sergio out of the office, telling the principal Deleon “Sergio is a rider on a mountain bike team and we’ve got a race tomorrow in Monterey. We have to go pre-ride the course.” With an expression that fell somewhere between consternation and concern, the principal paused before letting out a long slow “OhhhhKaaaay, so I guess we’ll call his parents to make sure?” I could read between the lines and upturned eyebrows. Was this even real? Mom was called, thumbs were turned up, lights turned green. We loaded up and pointed the car southward on what has been our bi-weekly mountain bike racing pilgrimage to Monterey for the past month. As soon as the tires started turning, the chatter and excitement turned up. Hunter was full of questions. Sergio was his usual coy self, smiling boyishly when asked about his pre-race mentality or what it felt like to come through the finish line at a race knowing you’ve left everything you had out on the course. We talked and talked and talked. The aniticipation was building like a kettle on the burner about to whistle. Time flew and before we knew it we’d shed the city grime and were feasting our eyes on rolling green vistas and the entrance to Fort Ord. It was time to stretch the legs on the race course for a pre-ride. Hunter got his race plate and we took off, winding along the sandy flowing singletrack that defines Fort Ord. After the pre-ride we ate, set up camp, told stories around the campfire and then knocked out for an early rise the next morning. Coach Morgan from Oakland Composite happened to pull into the neighboring campsite and joined us around the fire to share sage experience from years coaching a standout team. Saturday morning we awoke to dry-ish tents and broke camp in record time. The sky was full of clouds but glimmers of light filtered through as the sun rose giving promise for a rainless race day [cue a chuckle from the rain gods] . We made our way to the race venue and unloaded our meager team gear from the trusty “Prius truck” and set up--10x10 canopy tent, 6 ft folding table, white board, a milkcrate of tools and a floor pump. “It’s time to eat!” We headed over to our friends and generous pit hosts Berkeley High for something warm and delicious to fuel the races ahead. Following breakfast we took care of odds and ends, remaining prep, lots of hellos and headed over to cheer on the ladies as they started their race. Race days work kind of like a roller coaster. You labor and work to get up to race day and then when you get there you throw your hands up, holler and let gravity do it’s thing. It’s one thing to the next, non stop stimulation and excitement for eight hours. Once the ladies are off and racing the next wave of racers (freshman and sophomore boys) are getting ready to warm up. Before we know it it’s 3, 2, 1, GO and Jacob and Sergio are on course powering up the first gravel hill leaving only a dust cloud in their wake. The rest of our team goes into support mode. We cheer, we look out for riders on course, we hand up water bottles and yell like hell when we see a Richmond Composite rider on course. Coach Doug headed out to the midway point of the course to help motivate Sergio up a tough gravel climb. Sergio responded by finishing the climb and then powering off to catch the next rider. As the Freshman/Sophomore boys race was nearing its end, light rain began to fall. The rain was exciting, a fitting end to a hard race, until the rain quickly escalated from light to hard to insane in a matter of seconds. Sergio and Jacob were yet to come in from their race as the rain intensified. Do we look out for our riders finishing up or go check on our tent and equipment that was loosely strewn about in the sun filled morning some 10 minutes earlier? Do we welcome Sergio and Jacob with congratulations at the finish line or go try and contain the chaos that the incoming storm was surely unleashing on our pitzone? Yeah, let the rain come down and the wind howl, we’ve got racers coming in hot! Can’t miss that. Racers were spotted and embraced as they rolled through the finish line completing their final lap with rain soaked faces and exasperated smiles. This time, however, the finish celebrations were cut a bit short in an attempt to go address the weather situation. Everyone rushed over to our tent where team members, parents and random folks were dancing around as if playing a big game of tag where the rain was “it.” There was someone holding each leg of the tent, while someone frantically wrapped duct tape around bent tent legs as if bandaging a warrior in the battlefield mid fight. Spare bikes were duct taped to the tent as anchors as well, in our team effort to keep it from flying away. Everything was wet. The clothes, the backpacks, the signs, the tools, the people, everything. Rain pooled and poured off of our beaten tent canopy, adding insult to injury and turning the scramble to recover in the face of such unrelenting rain into pure comedy. Imagine trying to bail out of a sinking dingy with a slotted spoon. That was us. After the most intense part of the storm passed, we started to collect ourselves and our belongings. Well, some of us did. Some of us had to race. While Sergio and Jacob and remaining supporters helped turn our pitzone right side up, Hunter headed out on a warm up. With all the calamity we were a bit short on time for warming up. Plus it was wet. We scrounged up some type of rain shell for Hunter and headed out to try and get in the zone for racing. Focus was hard to come by with all the rain, but we did our best to work through pre-race nerves by mashing pedals and just marveling at what a crazy start to Hunter’s mountain bike racing career this was. Hunter lined up with the rest of the pack of JV and Varsity boys and took off up the start hill when the countdown got to 1. And the rain fell on. And we waited patiently for a sign of Hunter coming back through the start/finish after lap 1. When we spotted him after about 30 minutes, his spirits seemed high. His head was up, we exchanged words, he took a new full water bottle and I think he even smiled a bit. Or maybe it was a grimace. I’ll choose to remember it as a smile. Lap after lap Hunter came round with determination. He was going to finish. And the way he was drinking a bottle per lap and eating snacks I had no doubts he’d be crossing the finish line shortly. We waited cheering on other familiar faces on course until we spotted Hunter crawling up the last hill before the end. “Here comes Hunter! Let’s get to the finish line NOW!” All of the team gathered at the finish line to welcome him in. There was even a group of solid student riders from another team all lined up at the finish line with pots and pans and other noise makers giving some serious energy to riders coming in. Hunter rolled through looking exhausted but alive. He rolled right through the finish line and right through the finish shoot (an area where riders collect before leaving the course completely) and off into the distance. Hunter couldn’t stop. “Hunter, where are you going?” He rolled on. After podiums wrap up, we chat with racers, coaches and parents giving congratulations, hugs and high fives. Sergio and I found ourselves in a circle with Coach Morgan from Oakland Composite, Noah Hayes and his mom. “Give me three sentences to sum up your race Noah.” Asks Coach Morgan. Noah’s been asked this countless times post race now but he answers earnestly, honestly, and humbly as if he doesn’t have it all figured out yet. He explains some micro details about his race (which are really big things at the front of a race) including nutrition and strategy with the other racers. He tells a riveting short story about what was unfolding lap after lap, attack after attack, mud drop in the face after mud drop in the mouth. We’re right there with him. We jumped in the car and like riding down Main st. in the homecoming parade, we waved and said slow goodbyes to everyone as we rolled out of the venue and back north to Richmond. After three races I’d like to think we’ve got this whole thing figured out. And if by “figured out” you mean we’ve embraced the chaos and go-with-the-flow attitude needed to roll with all the punches that race day throws at you then I’d agree. We’re dialed. Race #4, here we come! When Monday of race week rolls around the mind begins to shift into planning mode. Logistics and prep take a front seat as plans begin to shake out. Are you coming? Do you need a ride? Where are you staying? Are you camping? Are you racing? Is your family coming? Is your bike in working order? Have you registered? Do you have a sleeping bag? And on and on and on. Add in a few practices during the week and the days leading up to the race seem to fly by in a blur of to-do lists and endless follow up. But then you wake up and it’s Friday morning. You pack the car, check your final to-do list and like pushing the pedals at the beginning of a long ride, before you know it you're off and the adventure begins. After a pretty steep first race learning curve we were feeling more settled as we drove down to Monterey on Friday afternoon for our second race. We left earlier, traffic wasn't as bad, the playlist was fire and the conversation moved from race questions and anticipation to immigration, school, work, the weather. We arrived to the race venue at Laguna Seca to the roar of Porsches burning rubber on the nearby car race track, an audible reminder that we too were there to burn some laps on the adjacent dirt. Six of us suited up in the parking lot, fastened helmets and made our way to the starting line to ride a lap together and check out Laguna Seca for the first time. After a short fire road climb the course hit singletrack and then picked up speed on a wide open fire road descent. It was short lived though. Before we knew it we were grunting up a paved climb that led into a super steep and rutted dirt section in the trees. After we punched up to the top things leveled out just long enough to catch our breaths before turning downward on a flowy singletrack trail that brought smiles to everyone's face. From chapparal to open fields, the trail twisted and turned through open meadows, alive with the green of springtime. The course was as lively as the dozens of other preriding teams out on course with us, exchanging hellos and “Hey aren’t we lucky to be out here?” sentiments. We collected in the parking lot and chatted about how each rider would approach the course the next day-when to go hard, when to ease up and recover, when to make a pass or let someone go. Then, we packed up the bikes and drove to our nearby campsite. At the campsite we got settled into our sites, unpacked and started setting up tents. With the sun setting overlooking a valley below we raced to blow up sleeping pads and stake down everything before our natural light was lost for the day. We loaded up again to head to dinner where we’d meet up with another part of our crew, two more student athletes and another coach. We ordered two extra large pizzas and gathered together to catch up and wait for two delicious pies to come our way. Hungry, we dove in as soon as the pizzas hit the table, but not before snapping a pic of our stellar crew. After dinner we caravaned back to the campsite where we got to work lighting a campfire and settling in for our nighttime activities. Lily and Alex had joined us in the car that arrived for dinner and we not planning on racing the next day. They took it upon themselves instead to bring the night activities and food extravaganza. As soon as the fire was lit, the bacon came out, the jalapeños were cut, a pot went on the grill with eggs inside and the picnic table turned into a bustling food prep area. We would be dining on jalapeño poppers with cream cheese and bacon to start and subsequent courses would get more interesting. After some good laughs and delicious culinary adventures kids started peeling off to their tents, the telltale sign it is time for bed. As the logs turned from flames to embers students could be heard drifting off into dreamland. We loaded up again and took off to the race venue to set up our team canopy tent and get ready for the day ahead. We arrived around 7:20am and the venue was already abuzz with activity. Grills were going, coffee was being poured and we were running around fixing things, headed to registration, greeting arriving riders and coaches and getting the blood flowing for a long day ahead. Before we knew it it was time to warm up. Coaches and student riders jumped on bikes and took to some nearby white gravel roads to spin up the legs and get ready to explode on the race course. We passed by San Francisco Composite as we warmed up, going in opposite directions as we got in the zone. After warming up we headed back to our team area for last minute tasks including water bottle fill ups, snacks and some mechanical fixes. Then we shuttled up to the start line to find our place in our race groups. It was Harrison’s first race and so he chatted with other riders from Alameda and Oakland as they waited nervously for their turn to race. In the first wave of Richmond Composite riders was Sophomore Harrison Rivera. He was a mix of nerves, excitement and pure steel cool. As he settled into the starting shoot and awaited his turn, waves of racers ahead were released. Then it was Harrison’s turn. The countdown ensued and his wave was off. Spectating you could see something wasn’t right with Harrison’s bike right out of the gate. He was frantically mashing the pedal down and then rotating it back half a turn before mashing it again. He was going nowhere. His chain, we’d find out shortly, had sucked down in between two chainrings and would need to be yanked free by hand. Coaches and another non-racing student rider jumped in to help Harrison free himself of his mechanical issue and hopefully continue the race. We got lucky and after fussing with the chain for a minute or two the pedals were turning again and Harrison was on his way, powering up the starting hill motivated by the setback to play catch-up. Within a short minute Harrison could be seen flying solo down the open fire road descent with determination in his eyes. He was finally off. In the next wave were three of our Freshman riders, Emilio, William and Sergio. Although it was the second race for all of them, nerves had been creeping into their minds all morning. Some manifested the nervousness with focus and quiet. Others darted around physically and verbally like an animal pacing, ready to make an escape dash at any moment. Their race started and riders began scrambling in the chaos for a better position as they worked their way up the starting gravel hill before the trail narrowed to singletrack. Teammates, parents and coaches cheered like hell for our riders. After the dust had settled on the last wave of racers our remaining team switched gears to support and cheer mode. Four non racers started the long journey out to the feed zone and beyond to Hurl Hill to provide mental support, water and nutrition as riders came close to finishing each lap. William had a crash that took him out of the race on the first lap and wound him up in the medical tent. When we found him he was telling stories and in good spirits wrapped in an emergency blanket eager to share what had happened. Harrison finished a second lap and called it good for his first race. He’d had a crash too and many subsequent issues with the chain that got stuck at the beginning of the race. He was beat! Emilio and Sergio had gone back and forth their entire race and came to the finish line just one second apart from each other--a great site to see. We ate lunch in the Berkeley High tent (Thank You BHSMTB!) and then circled up for our closing gratitude circle. Harrison got a lot of love for racing his first race and overcoming many challenges on the course today and somehow coming out all smiles. New parents came out for the first time to witness high school mountain biking and were blown away by the support and community present at these races. Four of our team riders (Donovan, Alex, Lily, Lucas) who came to support but not race this weekend got lots of shout outs too. They brought so much spirit and enthusiasm to our race weekend and exemplified what a team is all about. Our final race in Monterey is in less than two weeks and then we're heading north to Sacramento, Clear Lake and Petaluma for the remaining races of the season. If our team keeps showing up how we've been showing up--with positivity, enthusiasm and community spirit--then we'll continue winning in the fun category. And if there's one thing Richmond Composite is serious about it's winning all the fun. Join us in person on Wednesday March 28th from 6-8pm at Clif Bar in Emeryville for a team fundraiser including food, drinks, a short talk with student riders and coaches and a showing of the incredible documentary "Singletrack High". We kicked off our season with a team meeting yesterday at Rich City Rides. Prospective students and their parents sat together with coaches to talk about the season, what it means to be on a high school mountain bike team and most importantly sign up! We shared our excitement and fears about participating with the team and everyone got excited about camping together as well as getting stronger and encouraging each other on and off the bike. We capped off the meeting by watching the new Norcal video featuring other high school racers from around the area. We’ll be accepting new riders through the middle of January, but the sooner you sign up the better! That way you can see if you like it and enjoy a full season with everyone. Our first official practice is Sunday 12/17 at Alvarado Park. Join us!